Dr. Eben Davis, Clinic Director of Executive Express Chiropractic in downtown San Francisco, is pleased to join the ranks of a select group of health bloggers chosen to participate in the recently launched News & Analysis subdivision of Medpedia.com. The Medpedia Project is an evolving global information platform geared toward the advancement of knowledge about health, medicine and the body. Dr. Eben Davis, Clinic Director for Executive Express Chiropractic, is pleased to join the ranks of a select group of health bloggers chosen to participate in the recently launched News & Analysis subdivision of Medpedia.com. The Medpedia Project, in association with Harvard Medical School, Stanford School of Medicine, UC Berkeley School of Public Health and University of Michigan Medical School, is an evolving global information platform geared toward the advancement of knowledge about health, medicine and the body among medical professionals and the general public. Medpedia’s News & Analysis feature, launched earlier this week, delivers valuable content from screened and reputable sources including more than 150 professional, academic and scientific publishers. Interlinking capabilities give authors the ability to cite and cross-reference data throughout the Medpedia.com website. Published authors maintain full ownership and copyright of their own News & Analysis online content, with this section excluded from the website’s Creative Commons Share Alike license. In addition to its News & Analysis feature, Medpedia simultaneously launched Medpedia Answers, a comprehensive collection of health, medicine and body-related questions and answers tagged with both MeSH and plain-English headings, and Medpedia Alerts, a real-time alert distribution system with feeds available for organizations like the Centers for Disease Control and Prevention, the American Heart Association and the Red Cross. To access the online Medpedia knowledge base, visit http://www.medpedia.com. 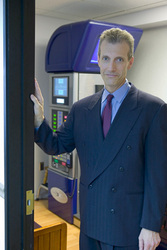 To learn more about Dr. Eben Davis or the Executive Express Chiropractic clinic, visit http://www.executiveexpresschiro.com or Dr. Davis’ Back & Wrist Pain Blog at http://www.sfbackpaindoctor.com.